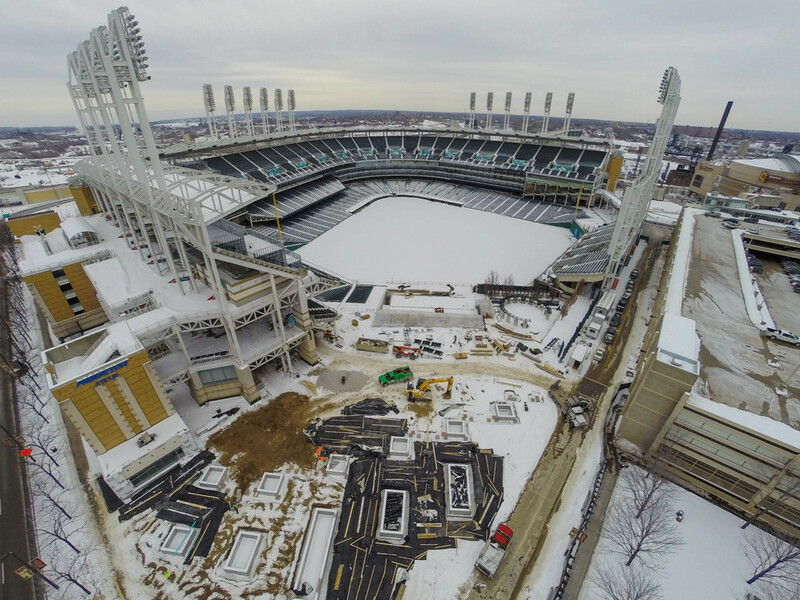 The Indians home opener is on April 10th against the Detroit Tigers. 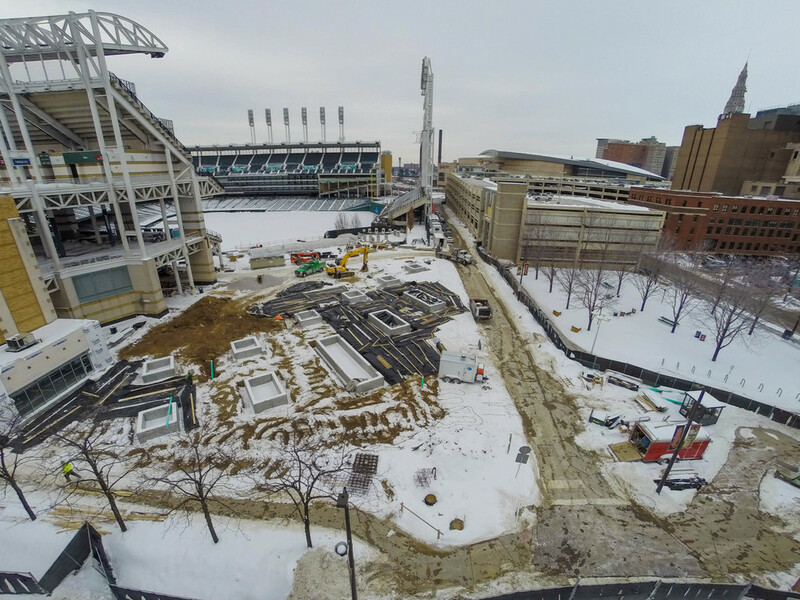 It's essential that the bullpens are completed by then and the Indians say construction is on schedule. Space for five neighborhood-themed areas behind the main concourse from center field to right field has been cleared. 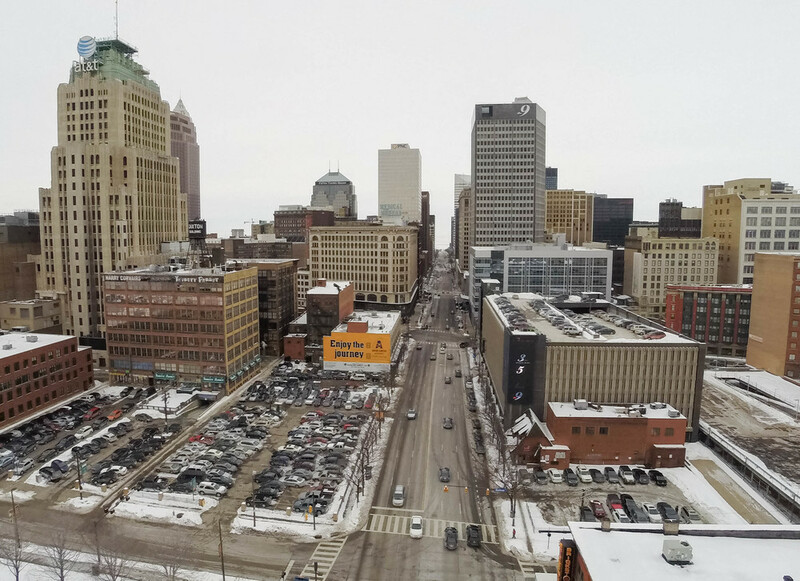 The areas will resemble Cleveland neighborhoods such as Ohio City and Tremont. A Whiffle ball field and batting cages will be constructed behind the mezzanine level. The old visitor's bullpen in the right field corner is being turned into a multi-level section of seats. There will be seats from the bar area on top of the bullpen with a staircase leading to field level seats. At the time of its opening in 1976, Randall Park Mall was the “world’s largest shopping center” boasting 2 million square feet of retail space. Developer Edward De Bartolo built the mall on the site of the Randall Race Track in the village of North Randall, Ohio. At the time of its opening, North Randall’s population was 1,500 and the mall’s employee population was 5,000. After decades of decline the mall was officially closed in March 2009. Today it stands abandoned, a relic of the past. CLEVELAND, Ohio —Believe in CLE is a yoga movement that began with the question "what if," which later turned into a reality. On Friday, thousands of people gathered on the grass lawn of Mall B, 300 Lakeside Ave., to join the movement of celebrating everything Cleveland. The setting showcased the beauty and growth of the city and the yogis represented the power of community. The 411: The popular gathering partnered with Land Studio and the "AHA! Festival of Lights" to welcome guests of the International Gay Games 9. The event began with a speech from Cleveland Police Deputy Chief Ed Tomba. Then, instructors Adam Tilocco and Tammy Lyons lead the 75-minute vinyasa yoga practice. Music was provided by DJ Rimon and local food trucks surrounded the area. Gary Shapiro is chief executive of the Consumer Electronics Association. Lightweight commercial drone aircraft are poised to transform industries from online retail to film and photography to farming and even Internet signal delivery. But delays in federal rule-making mean that U.S. businesses are stuck in limbo, unable to move forward with this exciting technology. While the rest of the world is putting these robots-on-wings to work in life-altering ways, U.S. policymakers continue to stifle innovation and economic growth by equivocating on the merits of drones. In 2007, the Federal Aviation Administration banned commercial drone use under the same rules that govern the use of model aircraft. Recently, Sen. Dianne Feinstein (D-Calif.), who chairs the intelligence committee, called for hefty regulation of drones. While the FAA has approved drones for use by hobbyists, as well as for one company to use them in remote parts of Alaska, it’s now time for the agency to consider whether more businesses should be allowed to fly them, given concerns about privacy and safety. Such issues have a real place in this debate, but continuing to keep commercial drones grounded is not the right answer. The issue of safety is of course of paramount concern, but other nations have been able to responsibly address the risks without shutting down all progress. The FAA has already investigated ways to integrate drones into U.S. airspace. It released a report on guidelines for small commercial drones — of less than 55 pounds — in 2009, but those guidelines were never transformed into final rules. The agency is now working toward an August statutory deadline — a deadline it isn’t likely to meet. As the FAA continues to hold commercial drones in abeyance, it may not have much of a legal leg to stand on. For one thing, the rules are inconsistent. The agency goes only after operators who make money from drone use, which is why individual hobbyists can fly them without repercussions. Then there are questions about whether the 2007 ban is enforceable. In March, a federal judge threw out a $10,000 fine the FAA imposed on a Swiss drone operator who used a drone to shoot a promotional video at the University of Virginia in 2011, on the grounds that the FAA failed to follow proper rule-making procedures. The agency has appealed the ruling to the National Transportation Safety Board. Sadly, there are plenty of examples of the FAA squelching drone use rather than developing a needed policy framework. The Washington Nationals are facing potential fines for using a drone to take promotional pictures during spring training. And a Minnesota brewing company was recently forced to stop drone deliveries to ice fishers. research company Teal Group. The industry is developing rapidly, and other countries are reaping the benefits. In Japan, drones have been used to spray crops for two decades. In Britain, drones are used to check the undersides of oil platforms, and real estate agents use them for promotional pictures. Germany, Australia and the United Arab Emirates are developing uses for the technology, from recording sporting events to delivering goods and documents. With its history of aggressive innovation, the United States should be a leader, not a laggard, in adopting new technology. This should be especially true with drones, which have so much potential in such diverse fields as moviemaking, newsgathering, agriculture, defense and public safety. Just consider how great U.S. companies such as FedEx, UPS, Dominos and Amazon have changed how we get products. If drones are to be a part of breakthroughs in distribution, shouldn’t we want that innovation to occur here? We need the spin-off jobs, industries and benefits that drones will provide. We cannot wait years for Congress and the FAA to approve regulations governing drones in our airspace. If we do, other nations will leapfrog us as innovators. Prolonged delay in the face of rapid technological change also means that rules risk being outmoded the day they’re issued. What is needed as soon as possible is a clear and straightforward policy framework that fosters innovation in this emerging industry. In November, the FAA issued a road map laying the groundwork for integrating drones into commercial aviation. This is an encouraging sign, but it is not enough. Drones will transform the way we live. They can boost the economy and create thousands of jobs. All it will take is for the government to get out of the way and allow innovators to do what they do best.